KCET Syllabus, Exam Pattern 2017: The Candidates who are looking for the Karnataka Common Entrance Test 2017 Syllabus, they are all advised to follow the complete details given below for accessing the subject wise KCET Syllabus 2017 for Physics, Chemistry, Biology, and Mathematics. You can access the ಕರ್ನಾಟಕ ಸಿಇಟಿ ಪಠ್ಯಕ್ರಮ 2017 with Unit wise details for all the Subjects that are there in the Kar CET Exam 2017. The Complete KCET Selection Process and the Seat Allotment Procedure is given below, you can check the various possibilities that may confuse you while taking admission after clearing the KCET Cutoff. 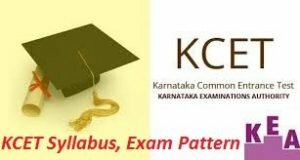 KCET Exam Pattern 2017: To check the New Exam Pattern for Karnataka CET 2017, you all have to go through the details given below. The KCET Exam 2017 will be conducted into 2 Sections, in the 01st Section, it will conduct the Exam for Mathematics and Biology Paper, and then after in the 02nd Section it will conduct the exam for Physics and Chemistry. There are total 180 questions in the three sections and the time limit provided for solving the questions in each section is 01 Hour and 20 Minutes. For Medical Students, first of all, they need to appear in the Biology Exam and after that, they have to appear in the Physics and Chemistry Paper. For Engineering Students: They need to appear in the Mathematics Exam and after that, they have to face the Physics and Chemistry Exam. Each question carries 01 Mark, so the total marks from which the final cutoff will be declared are 180. Note: There is no Negative Marking for the wrong answer. KCET Syllabus 2017: The Karnataka Examination Authority has released the New Karnataka CET Syllabus 2017 for the KCET Exam 2017. The examination will be conducted in 02 Parts, the first exam will be conducted for Biology and Mathematics & then the second exam will be conducted for Chemistry and Physics. The KCET Medical Syllabus 2017 consist three subjects Physics, Chemistry, and Biology, while the Karnataka CET Engineering Syllabus 2017 consists Mathematics, Physics, and Chemistry. We are here to make you available with the complete syllabus for KEA KCET Syllabus 2017 and hence we are prescribed the detailed topics for all the subjects that comprise the complete syllabus for Karnataka Common Entrance Test 2017. The Candidates need to clear the Cutoff for the written exam and then after the qualified candidates will be allotted with their seat in the respective Engineering/ Medical College. If the candidates get satisfied with the allotted seat, then they have to pay the suggested fees for confirming their interest in occupying the allotted seat. Then candidates need to download the hard copy of the Admission Letter and after the verification, they will be admitted in the respective colleges as per the rules. We have provided you the complete details concerning the KCET Syllabus 2017 above and we hope that you will be able to access the satisfactory information from the details we have provided you above. If you are facing any of the difficulties regarding the Karnataka CET Exam Pattern 2017, you are advised to contact us by commenting at the bottom of the post, we will make you available with the most optimal solutions to your queries as soon as possible.